October 27, 2011, filed under Bring Our Troops Home, Country-Wide, White Flag Revolution; No Comments. Across the UK people will be striking to highlight the severe financial cuts our Government has imposed on the people of our country, as a direct result of our on-going illegal wars of aggression against the people of Afghanistan. Meanwhile, we are expected to find money to pay the EU bankers for the financial crisis created by their own greed and incompetence. WE PAY THEIR BILLS ! WILL THEY PAY OURS?……..NO!……THEY SEND THE BAILIFFS! The on-going war in Afghanistan has cost BILLIONS. Soldiers, civilians, women and children have been killed and seriously wounded. WHAT FOR? …..Because endless global wars are HUGLY PROFITABLE. Why then, do we all go along with it? We know it’s wrong, yet we submit like sheep everyday ! Sorry, but by complying, we allow our Government to wage illegal, immoral wars of aggression. If we really want to address the situation and deliver justice to the people of Afghanistan, if we really want to regain our self respect as a nation and as a people, then we must unite and stand together to DEMAND that our Government stops hostilities and orders the troops home. Some will have to stay for humanitarian reasons. We don’t need a world full of armies opposing each other. We need to feed the hungry, tend to the sick, and clothe and shelter the poor. That is the duty of humankind, whether we like it or not. Reality check– Let’s all unite and go on strike together for all the reasons mentioned, with the aim of actually achieving our objective. 10 years of protesting, marching, campaigning and lobbying has simply not been enough! We have NOT STOPPED ANY WAR……….THEREFORE…. We now need to SHUT DOWN for 3 Days in order for our strike to be effective. By collectively being on “Peace Strike” together, we – the ordinary people – become the most powerful that we can be. We will send a clear message to our government that we will not support any acts of aggression towards innocent citizens of any country… we will not be deceived into waging wars for ‘Global Corporate’ greed and power. Including pensioners, housewives, students, claimants, the disabled, families, etc., joining together in solidarity for peace. *Note This does not include emergency workers and carers, whose work and travel we support. Police, Fire Service, Nurses, Doctors, Ambulance Crews, Carers, and Emergency Utility Workers. Prepare for the strike days in advance so that we are organised and have enough food, drink and medical supplies to carry us over a week to facilitate any disruption our action may cause us. Make sure we have enough provisions for children and the elderly, our families,not forgetting any pets. Let people in your area know, including older and vulnerable people, so they have time to prepare. Enjoy your time off to relax and reflect; spend precious time with family and friends. Treat it like you would an extended Christmas break. * If necessary, we will continue to call follow-up strikes, in order to make our Government comply with the wishes 0f the people -who elected them- and whom they serve. Under international law it is a criminal offence to assist in a crime against humanity, a crime against peace and a crime of genocide. Therefore to go ‘ON STRIKE FOR PEACE’ to save life can only be a moral duty and not an offence in law. We ask all people to be united in peaceful non-violent inaction. Pass the message on, nationally and internationally. Peace Strike operates a 24-hour on-going ‘Peace Picket’ at Parliament Square, London, UK. October 3, 2011, filed under White Flag Revolution; No Comments. 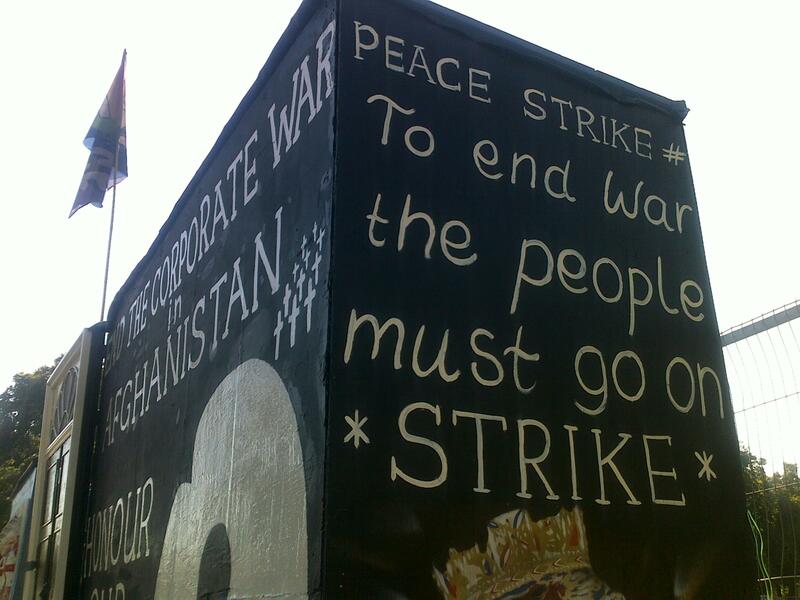 PEACE STRIKE is a 24 hour on-going strike picket opposite the Houses of Parliament in the UK. It makes the declaration that the majority of the people in our country oppose the on-going corporate wars that our Government has been engaged in for the past 10 years….. The demands of our stand to our Government is ‘ Listen to the people, and then ACT on our demands to ‘BRING OUR TROOPS HOME ! At some point……….. we will all need to join the STRIKE !